Here we go again, indeed – one must grit one’s teeth into the rictus of forced jollity needed to endure/enjoy the sheer froth of a second jaunt into the world of Abba songs on a Greek island in the company of people about whom one doesn’t give even half a hoot. Amanda Seyfried is opening a hotel in honour of her deceased Mum (they couldn’t get Meryl Streep back for the sequel, much), which is the plot device to get everyone back for the grand opening – as this charming yet decidedly un-luxurious little place would attract millionaires. What does work, if you surrender to it, is the flashback structure following the young Meryl (played with winning, toothy, honey-glowing summery attractiveness by Lily James) and her heady few days getting from Oxford to the Greek island, via Paris (and a version of Waterloo sung in a Napoleon-themed restaurant, with baguettes for sax solos), and some sail boats. The casting and seamless time-toggling is the best thing about the film, using witty choreography to skip back and forth and cram a great deal of backstory and tangent into a very economical run time of under two hours. Director and screenwriter – with Richard Curtis – Ol Parker deserves great credit for this. Of course it’s rubbish, but it never pretends to be anything else and all performers commit to it with gusto. I can’t say the first film left me wanting more, but given that it’s a ride I’m being forced to take anyway, there’s no point in grumping from the sidelines and hurling critical cliches at the shimmering canvas. One must give oneself to it, like a Club Med holiday and enjoy the cheesiness (feta, of course) – thus you can even laugh at Cher and Andy Garcia singing Fernando, or find yourself tapping along to Name of the Game and remembering all the words to One of Us even as Dominic Cooper’s murderous rendition tries to put the song out of its misery forever. 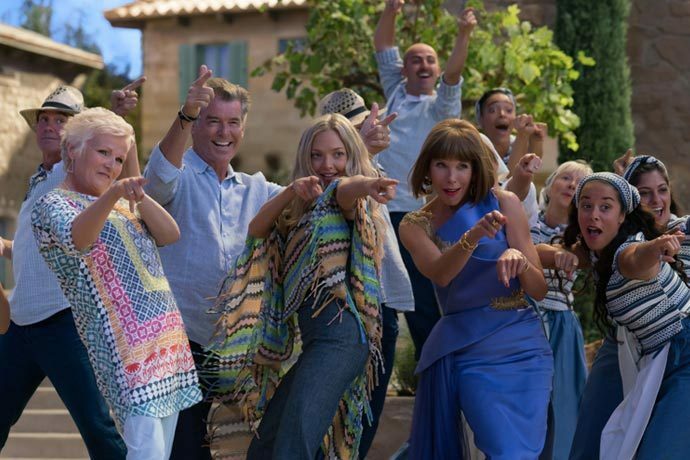 You’ll love Mamma Mia 2 – and that’s an order.